Home Movies Cannes It! SKYcable brings the Spirit of Cannes Film Festival home! Cannes It! SKYcable brings the Spirit of Cannes Film Festival home! You’ve watched Avengers Infinity War a multitude of times and they’re still the main selection in most cinemas nationwide. So, you want something new and a little bit “meatier” than the next Hollywood blockbuster? Well, SKYcable got you covered. 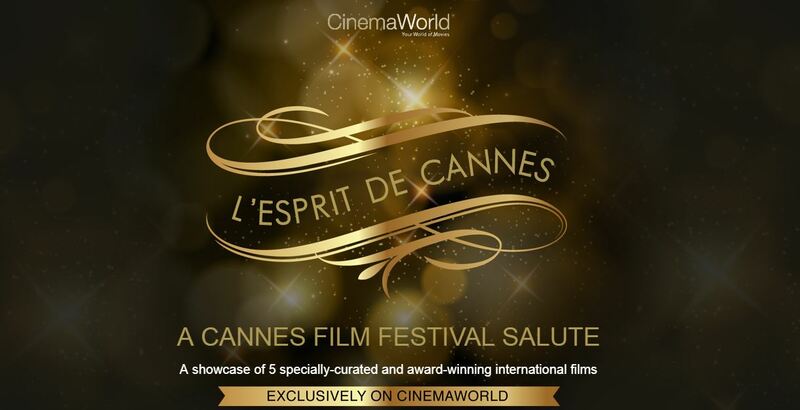 Today, May 13 and a special encore on May 19 (Saturday), SKYcable through Cinemaworld, a high definition channel of the cable, is bringing the “Spirit of Cannes” Film Festival to your living room with 5 award-winning, thought-provoking cinemas for you to binge on. Ready your artsy hats on, prepare some hors d’oeuvre, and pour a glass of chardonnay, it’s time for Cannes. At 2:30PM today the marraton begins with “Mammal”, a drama that explores the developing relationship between a divorcee (Rachel Griffiths) and a troubled young man (Barry Keoghan). The second film directed by Rebecca Daly, this powerful drama explores unorthodox relationships, loss, grief and redemption wrapped in a sensual and seductive arthouse lens. A feast of hilarity ensues when Gianni (Gianni Di Gregorio), a happy-go-lucky middle aged man has the odd circumstances of needing to take in 3 aging elderly women at his home over a local holiday in Italy. Directorial debut of Gianni Di Gregorio, the film won several awards at various film festivals around the world, most notably winning the “Luigi De Laurentiis” Award for the First Feature Film at the 65th Venice Film Festival and the Satayjiit Ray award at London Film Festival. The surprise in all of this is, for the women that Gianni had to “take care” of on film, Di Gregorio chose to cast non-actors including his own aunt and a family friend. Mid-August Lunch showcases the wonders of Italian culture, food, and family. Abel explores the trauma, mental illness and family dynamics in Mexico through the eyes of this small almost rural family. The central character in all of this is Abel, a nine-year-old-boy who after years have stopped speaking since his father left home suddenly started to speak again, but this time pretending to be the head of the household, even started acting like one. Abel’s mother puts up with this versus the alternative of locking Abel in a ward and everyone tries to cope with the strangeness until one day a man shows at the door – his father. The film is directed and co-written by Diego Luna (Y Tu Mama Tambien/ Star Wars Rogue One) who sprinkles the otherwise serious tone of the film with light-hearted brevity. But really, it’s Christopher Ruiz-Esparza’s excellent portrayal of Abel who balances acting like the head of the family and a kid with bouts of personal trauma and occurring mental illness is the true gem of this amazing film. Victor, a crime novelist and his son Zach, a celio-player find themselves in similar predicament – the women in their lives left them at the same time. In the midst of this gaping absence, the two took it upon themselves to sort things out and figure out their relationships as they both embark on a trip to Scotland where Victor’s latest book will be promoted. The film takes your breath away with stunning sceneries, heart-felt performances and a wonderful soundtrack selection from the Waterboys (a Scottish/Irish folk band). If arthouse drama and comedy isn’t your thing, then Infiltration could be the thrill you’re looking for. This slow-burn thriller focuses on a well-respected plastic surgeon who descends into psychological spiral after an encounter with a disgruntled patient. Christian Begin who plays the doctor offered a superbly effective performance despite this being his first major role in cinema after 30 years. Director Robert Morin knows how to pace Infiltration well building the anxiety bit by bit until he offers very little respite to breathe as he brings the film to its heightened haunting end. If you have a favorite among the 5 let your voice be heard and vote for the film that you wish to see again on May 19 at 9PM as a special Encore. Head over to http://cinemaworld.asia/lespritdecannes/ from May 13, 2:30PM to May15, 5:30PM only. SM Cinema is showing Kingsglaive: Final Fantasy XV NEXT WEEK! Latest Doctor Strange Trailer bursts out of SDCC 2016!